​”Just one more scoop”, the father intones to his pre-schooler for the second time in as many minutes. 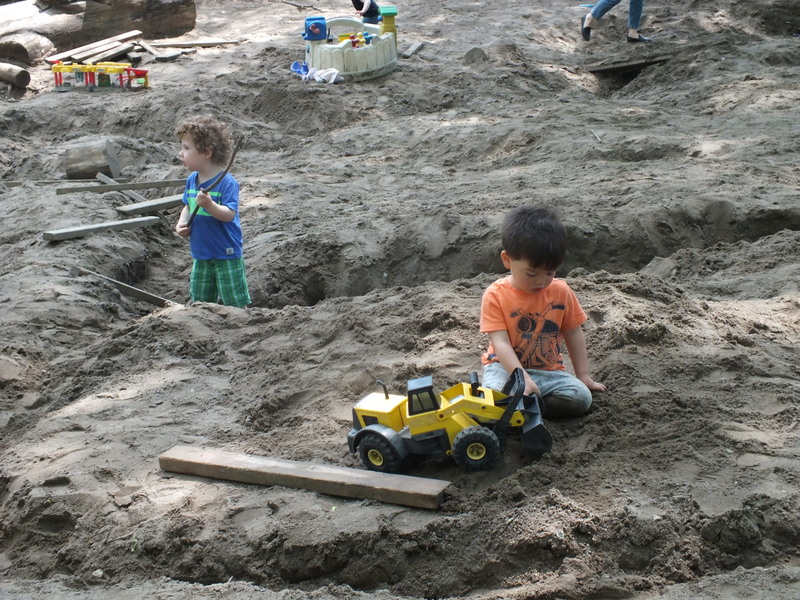 “It’s time for us to go.” Here in the southeastern reaches of Toronto’s Dufferin Grove Park, the three-year-old digger boy is busy moving dirt from a deep channel to level ground in the most ginormous kid’s sandpit in Canada. Welcome to Shangri-la for kids, a place where dirt rules. Here kids build, dig, and create worlds of their own making with shovels, scraps of wood and a dedicated supply of glorious running water. Above this constantly changing excavation site is a whispering canopy of mature maples. Even on the hottest days there is respite from the sun. In the early 1990s, the playground started as a ‘big backyard’ neighbourhood space with the sandpit as its central feature. Community engagement, affordability and adventurous, drop-in play were the key founding principles as relayed in this presentation that captures the back story and some of the history of this enchanting space that captivates kids from pre-school to just shy of pre-teen. More than 20 years after its establishment, this quiet success continues to have star attraction chops. 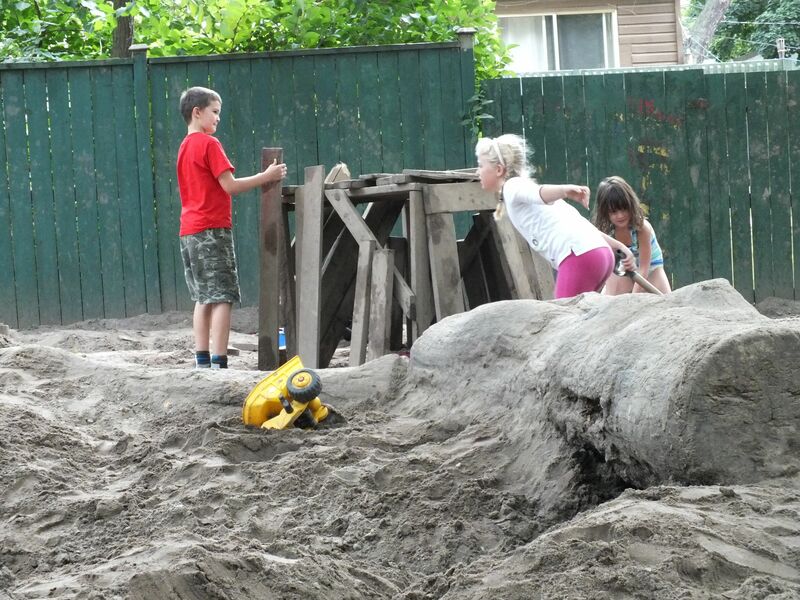 For those in the know, it is a highly desirable destination where simplicity – dirt, water, dig, build – provides a solid foundation for independent play. On my first visit, I chatted with a couple of moms who were there with their pre-schoolers. It is their favourite public playspace in Toronto. Many share this opinion. Both women travel by car, or bus to give their kids the chance to enjoy themselves in this sandpit-like-no-other. I now have it on the highest authority – my soon to be two-year-old granddaughter – that this is the funnest!! place to play…. One brilliant May morning on a recent Toronto trip, I visit Dufferin Grove’s sandpit with its rivulets, gullies and hillocks of dirt. The action underway is an unfurling tapestry. There is an almost imperceptible hum of discovery under the trees. The kids are zoned in, under the spell of a space that invites them to just play, to fashion time measured in scoops of dirt and pails of water. As I’m getting ready to leave, there is a wonderful serendipitous moment. I bump into Jutta Mason. We have corresponded about the play universe but never met. Jutta is an indefatigable champion for public community spaces in general and for this space of play in particular. Time didn’t allow for much more than hellos, a hug and a promise on my part to connect when I am in TO again. That will be part II of PlayGroundology‘s Dufferin Grove story. Stay tuned later this summer for first person accounts from Jutta and Mr. PlayGroundology as he goes to the Grove for the first time with his granddaughter. We’ll also have the opportunity to discover the Centre for Local Research into Public Space (CELOS), a strong community-based research model established by Jutta and other community volunteers. 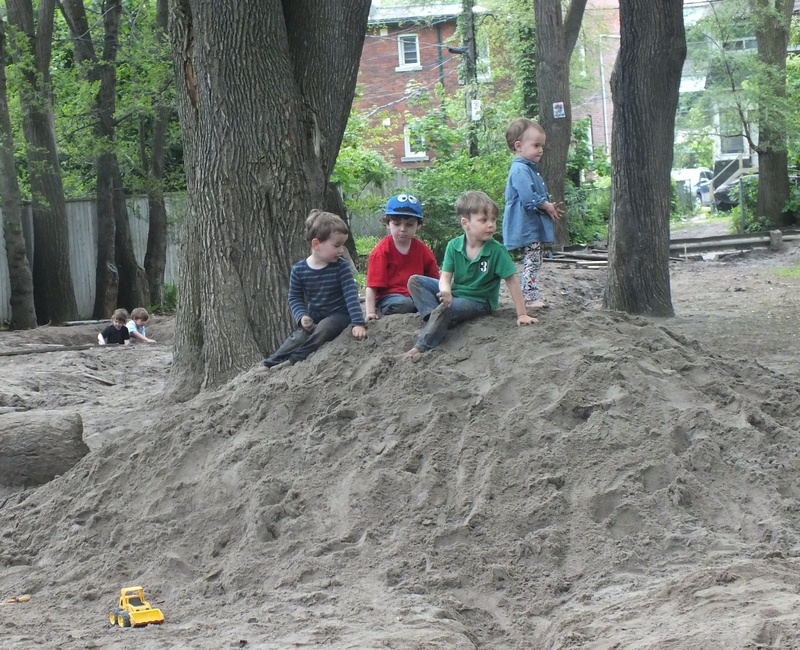 Until then, bear in mind that ‘just one more scoop’ at Dufferin Grove’s sandpit is a tough concept for kids to embrace. From what I’ve seen on my visits, the kids are happy to stay as long as possible. 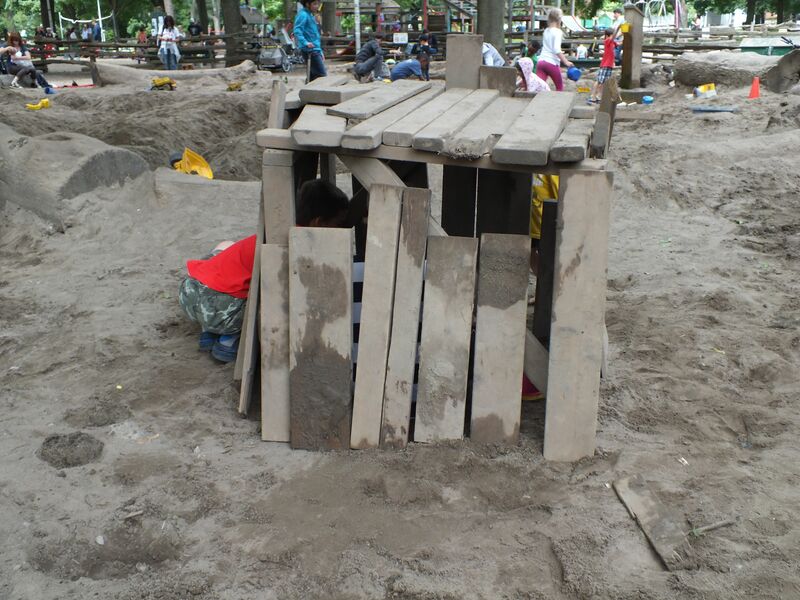 Some even design and build temporary shelters…..